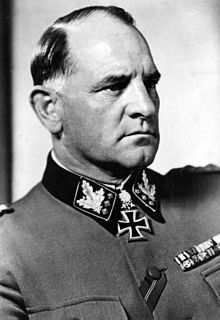 Wilhelm Bittrich (26 February 1894 – 19 April 1979) was a high-ranking Waffen-SS commander of Nazi Germany. 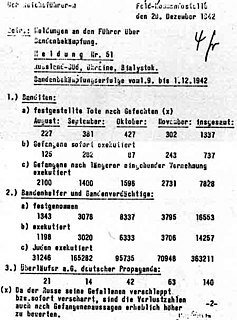 Between August 1942 and February 1943, Bittrich commanded the SS Cavalry Division Florian Geyer, in rear security operations ( Bandenbekämpfung , literally: "bandit fighting") in the Soviet Union. From July 1944 until the end of the war Bittrich commanded the 2nd SS Panzer Corps in Normandy, during Market Garden and in Hungary. HIAG was a lobby group and a denialist veterans' organisation founded by former high-ranking Waffen-SS personnel in West Germany in 1951. Its main objective was to achieve legal, economic and historical rehabilitation of the Waffen-SS. Advocacy groups use various forms of advocacy in order to influence public opinion and/or policy. They have played and continue to play an important part in the development of political and social systems. 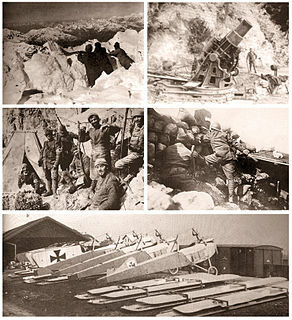 The Italian Front or Alpine Front was a series of battles at the border between Austria-Hungary and Italy, fought between 1915 and 1918 in World War I. Following the secret promises made by the Allies in the Treaty of London, Italy entered the war in order to annex the Austrian Littoral and northern Dalmatia, and the territories of present-day Trentino and South Tyrol. 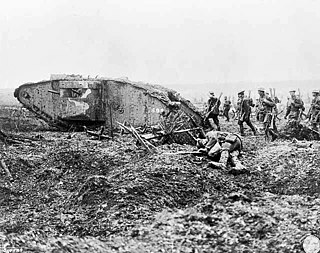 Although Italy had hoped to gain the territories with a surprise offensive, the front soon bogged down into trench warfare, similar to the Western Front fought in France, but at high altitudes and with very cold winters. Fighting along the front displaced much of the civilian population, of which several thousand died from malnutrition and illness in Italian and Austrian refugee camps. 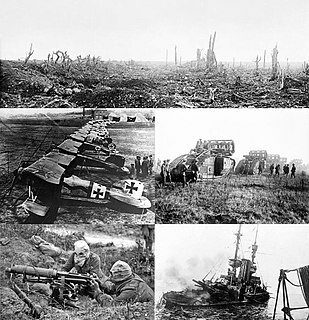 The Allied victory at Vittorio Veneto, the disintegration of Austria-Hungary and the Italian capture of Trento, Bolzano and Trieste ended the military operations. Bernhard Franz Karl Adolf von Hülsen was a German general. The SS-Verfügungstruppe (SS-VT) was formed in 1934 as combat troops for the Nazi Party (NSDAP). On 17 August 1938 Adolf Hitler decreed that the SS-VT was neither a part of the police nor the German Wehrmacht, but military-trained men at the disposal of the Führer. At the time of war, the SS-VT were to be placed at the disposal of the army. 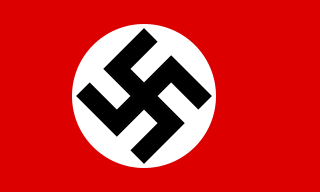 Obersturmbannführer was a paramilitary German Nazi Party (NSDAP) rank used by both the SA and the SS. It was created in May 1933 to fill the need for an additional rank above Sturmbannführer as the SA expanded. It became an SS rank at the same time. Translated as "senior assault unit leader", Obersturmbannführer was junior to Standartenführer and was the equivalent to Oberstleutnant in the German Army. The insignia for Obersturmbannführer was four silver pips and a stripe, centered on the left collar of an SS/SA uniform. The rank also displayed the shoulder boards of an Oberstleutnant and was the highest SS/SA rank to display unit insignia on the opposite collar. Josef Dietrich was a German politician and SS commander during the Nazi era. He joined the Nazi Party in 1928 and was elected to the Reichstag of the Weimar Republic in 1930. Prior to 1929, Dietrich was Adolf Hitler's chauffeur and bodyguard. 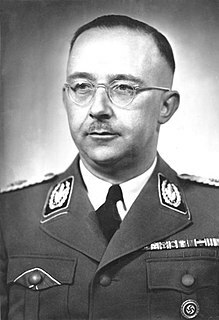 He received rapid promotions in the SS after his participation in the extrajudicial executions of political opponents during the 1934 purge known as the Night of the Long Knives. After his arrest on 8 May 1945 he was extradited to France on charges of having ordered the execution of 17 members of the Resistance in Nîmes. The trial revealed that Bittrich had not given such an order and had even opened procedures against the responsible officers. As the commander in charge of the troops who committed the execution, he was held responsible for their misconduct and sentenced to five years in prison. The sentence was considered as served after a long pretrial detention. He was put on trial for a second time in 1953 and sentenced to five years in prison for countenancing hangings, pillage and arson,  but was acquitted by the French court in Bordeaux again and released in 1954. He was never brought to trial for any actions and war crimes of the 8th SS Cavalry Division Florian Geyer in the Soviet Union. Erich Abraham was a general in the Wehrmacht of Nazi Germany who command the 76th Infantry Division then the LXIII Corps on the Eastern Front during World War II. He was also a recipient of the Knight's Cross of the Iron Cross with Oak Leaves. Hermann August Fredrich Priess was a German general in the Waffen-SS and a war criminal during World War II. He commanded the SS Division Totenkopf following the death of Theodor Eicke in February 1943. On 30 October 1944 he was appointed commander of the I SS Panzer Corps and led it during the Battle of the Bulge. Matthias Kleinheisterkamp was an SS-Obergruppenführer during World War II. He commanded the SS Division Totenkopf, SS Division Nord, SS Division Das Reich, III SS Panzer Corps, VII SS Panzer Corps, IV SS Panzer Corps, XII SS Army Corps and the XI SS Army Corps. He was a recipient of the Knight's Cross of the Iron Cross with Oak Leaves. Werner Mummert was a general in the German Wehrmacht during World War II who commanded Panzer Division Müncheberg. A veteran of World War I, he was also a recipient of the Knight's Cross of the Iron Cross with Oak Leaves and Swords. Mummert surrendered to the Soviets in May 1945 and died in a prisoner of war camp five years later. Otto von Knobelsdorff was a German general during World War II who led the 19th Panzer Division and then held a series of higher commands. He was a recipient of the Knight's Cross of the Iron Cross with Oak Leaves and Swords. Josef Harpe was a German general during World War II who commanded the 9th Army. He was a recipient of the Knight's Cross of the Iron Cross with Oak Leaves and Swords of Nazi Germany. Theodor Wisch was a high-ranking member of the Waffen-SS of Nazi Germany during World War II. He was a commander of the SS Division Leibstandarte (LSSAH) and a recipient of the Knight's Cross of the Iron Cross with Oak Leaves and Swords. He assumed command of the LSSAH in April 1943. He was seriously wounded in combat on the Western Front by a naval artillery barrage in the Falaise Pocket on 20 August 1944, and replaced as division commander by SS-Brigadeführer Wilhelm Mohnke. Otto Baum, was a high-ranking commander (Oberführer) of the Waffen-SS during World War II. He was a recipient of the Knight's Cross of the Iron Cross with Oak Leaves and Swords of Nazi Germany. Karl Decker was a general in the Wehrmacht of Nazi Germany during World War II who committed suicide in the Ruhr Pocket on 21 April 1945. He was a recipient of the Knight's Cross of the Iron Cross with Oak Leaves and Swords. Friedrich Erich Walther was a German paratroop general during World War II. He was a recipient of the Knight's Cross of the Iron Cross with Oak Leaves and Swords of Nazi Germany. Walther commanded the Hermann Göring 2nd Parachute Panzer-Grenadier Division in East Prussia. He was promoted to Generalmajor on 30 January 1945. Walther surrendered the Red Army on 8 May 1945. He died at Soviet Special Camp 2 on 26 December 1948. Friedrich Kirchner was a German general during World War II who commanded 1st Panzer Division and the LVII Panzer Corps. He was a recipient of the Knight's Cross of the Iron Cross with Oak Leaves and Swords. Rudolf Lehmann was a mid-ranking commander the Waffen-SS of Nazi Germany during World War II. He was a recipient of the Knight's Cross of the Iron Cross. Following the war, Lehmann authored a unit history of SS Division Leibstandarte published in German by HIAG, the post-war Waffen-SS lobby group, and in English by J.J. Fedorowicz Publishing. Hellmuth Becker was a German SS commander during the Nazi era. In World War II, he led the SS Division Totenkopf and was a recipient of the Knight's Cross of the Iron Cross with Oak Leaves. Post-war, Becker was tried by Soviet authorities twice, for war crimes and sabotage, and was executed in 1953. 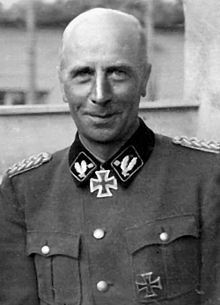 Johannes-Rudolf Mühlenkamp was a German SS commander during World War II who led SS Division Wiking. He was a recipient of the Knight's Cross of the Iron Cross with Oak Leaves of Nazi Germany. Joachim Rumohr was a German SS commander during the Nazi era. He commanded the SS Cavalry Division Florian Geyer. Georg Jauer was a general in the Wehrmacht of Nazi Germany during World War II. He was a recipient of the Knight's Cross of the Iron Cross with Oak Leaves. Walther von Hünersdorff was a German general during World War II who commanded the 6th Panzer Division. He was a recipient of the Knight's Cross of the Iron Cross with Oak Leaves of Nazi Germany. Harald Freiherr von Elverfeldt was a general in the Wehrmacht of Nazi Germany during World War II who commanded the 9th Panzer Division. He was a recipient of the Knight's Cross of the Iron Cross with Oak Leaves. Maximilian Fretter-Pico was a German general during World War II. He was a recipient of the Knight's Cross of the Iron Cross with Oak Leaves of Nazi Germany. 1 2 3 4 Stockert 2012, p. 227. 1 2 3 Miller 2006, p. 128. 1 2 3 Thomas & Wegmann 1992, p. 85. ↑ Westemeier 2013, p. 137. 1 2 3 4 Thomas & Wegmann 1992, p. 87. 1 2 Miller 2006, p. 127. 1 2 Miller 2006, p. 129. ↑ Miller 2006, p. 130. ↑ Blood 2006, p. 75. ↑ Miller 2006, pp. 130, 131. 1 2 Miller 2006, p. 132. 1 2 Scherzer 2007, p. 121. ↑ Chairoff 1977, p. 460. 1 2 Miller 2006, p. 133. ↑ Thomas 1997, p. 47. 1 2 Scherzer 2007, p. 224. ↑ Patzwall & Scherzer 2001, p. 44. Blood, Phillip W. (2006). 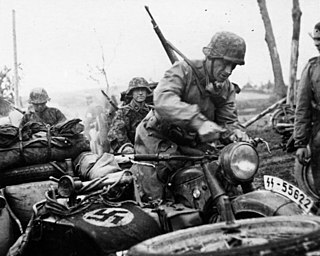 Hitler's Bandit Hunters: The SS and the Nazi Occupation of Europe . Potomac Books. ISBN 978-1-59797-021-1. Chairoff, Patrice (1977). Dossier Néo-nazisme (in French). Ramsay. ISBN 978-2-85956-030-0. Stockert, Peter (2012). Die Eichenlaubträger 1939–1945 Band 6[The Oak Leaves Bearers 1939–1945 Volume 6] (in German) (3rd ed.). Bad Friedrichshall, Germany: Friedrichshaller Rundblick. OCLC 76072662. Thomas, Franz; Wegmann, Günter (1992). Die Ritterkreuzträger der Deutschen Wehrmacht 1939–1945 Teil III: Infanterie Band 2: Bi–Bo[The Knight's Cross Bearers of the German Wehrmacht 1939–1945 Part III: Infantry Volume 2: Bi–Bo] (in German). Osnabrück, Germany: Biblio-Verlag. ISBN 978-3-7648-1734-3. Westemeier, Jens (2013). Himmlers Krieger: Joachim Peiper und die Waffen-SS in Krieg und Nachkriegszeit[Himmler's Warriors: Joachim Peiper and the Waffen-SS during the War and Post-War Period]. Paderborn, Germany: Ferdinand Schöningh. ISBN 978-3-506-77241-1. Kershaw, Robert J. (1994): It never snows in September. Ian Allan Ltd. ISBN 0-7818-0287-3.